Newly revised and expanded Second Edition! By Larry Blocher, Eugene Migliaro Corporon, Ray Cramer, Tim Lautzenheiser, Edward S. Lisk, Richard Miles. Compiled and edited by Richard Miles. Freshly revised and completely rewritten, the landmark book that broke new ground now contains more theoretical, practical, and analytical insights than ever. 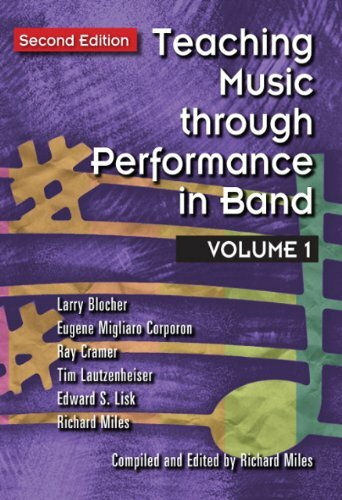 This greatly expanded Second Edition takes full advantage of the experience gained from creating seven volumes devoted to all aspects of the band profession. This new edition provides band directors with the tools they need to help performers move beyond the printed page to musical awareness and understanding. Every chapter is updated to reflect the most recent developments in the wind band genre and community. Each enhanced Teacher Resource Guide provides practical, detailed reference to 100 of the best-known and foundational band compositions, Grades 2 6, and their composers. The chapters in Part I examine the same topics as the first edition, but the writing is both richer and deeper, thanks to the more than seventy additional years of combined experience. The expanded Teacher Resource Guides provide greater detail, more insight, and far more practical guidance for streamlining and energizing rehearsals. Each Teacher Resource Guide now also includes a thumbnail reference that lists the publisher, date of publication, and duration of each work. Chapters include Focus (Larry Blocher), Our GPS for Success: It s All about the Literature! (Ray Cramer), The Quantum Conductor (Eugene Migliaro Corporon), Assessment of Student Learning in Band (Larry Blocher), Units of the Teacher Resource Guide (Richard Miles), Building a Sound Rehearsal (Edward S. Lisk), Curricular Models Based on Literature Selection (Richard Miles), and The Essential Element to a Successful Band (Tim Lautzenheiser). This Second Edition is a vital and essential resource truly a major contribution to the wind band profession.